Anchors Marisol Mena and Clodomiro Landeo, both native Quechua speakers, aim at not only repeating the Spanish news translated into Quechua, but rather presenting them with other references and complementing the information through a different perspective. Quechua, the language of the Inca empire was oppressed and outlawed during Spanish colonization. And even though Peru recognized Quechua as official language over 40 years ago, the reservations against this beautiful, lyrical native language and its speakers remained. Today the about 4 million native Quechua speakers, 13% of the population most of them living in the Peruvian highlands, are still stigmatized and associated with being poor, uneducated and even inferior. 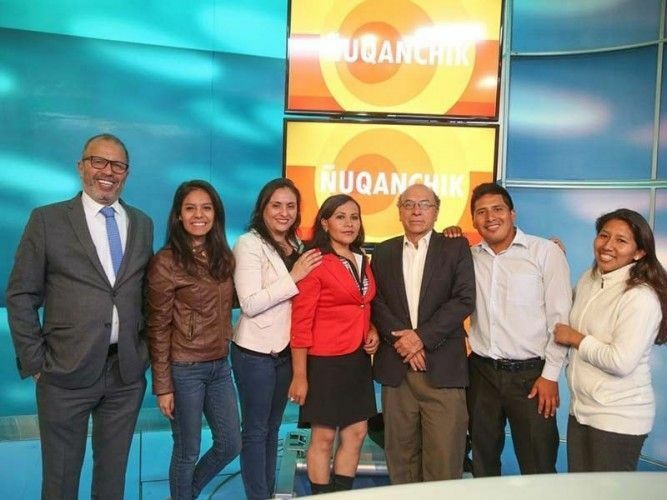 So, the Quechua news program “Ñuqanchik” represents another little step to integrate and acknowledge speakers of this native language and will have a huge impact on the lives of millions of monolingual Quechua speakers. Giving indigenous Peruvians a voice again and cherishing their culture, traditions and perspectives, will not only bring pride and improve the image of natives in Peru, but also promote the country’s cultural diversity and keep Quechua alive for hopefully many generations. “Ñuqanchik” is broadcasted weekdays at 05.30 am.